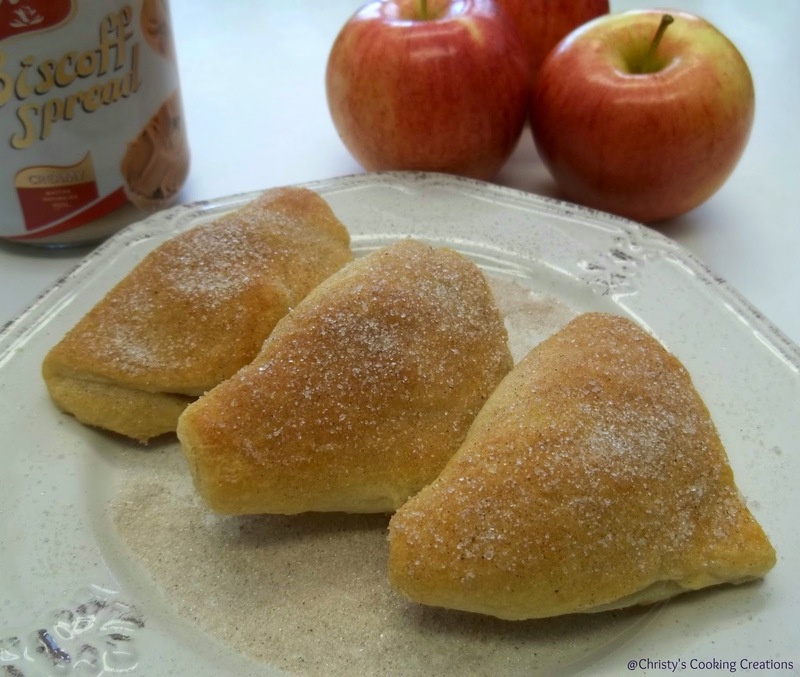 Quick and simple mini turnovers made with apples, crescent rolls and Biscoff Spread. turnovers made with apples, crescent rolls and Biscoff Spread. These babies can be whipped up in a jiffy for a delicious breakfast, snack or dessert treat. rip that jar open, grab a spoon and dive in like a mad woman. I did this, ummhmm, several more times over the course of a couple of days. Needless to say, this was my clue to make something with this spread before I consumed the whole jar. Anybody else been there, done that? I usually (when not on an OMG! I just found a jar of Biscoff tear) eat the spread with apple slices. The spiced caramel flavor of the Biscoff pairs perfectly with apples. Wrap that combo up in some crescents with a sprinkle of cinnamon sugar and you have a delightful mini apple pie treat. I am anxious to try this and swap the Biscoff for peanut or almond butter. Which do you think would be your favorite? Place Biscoff in a bowl and stir, add in apples and mix to coat all apple pieces with Biscoff spread. Unroll one package at a time of crescent rolls. Pinch seams together to create large rectangle and flatten very slightly with palm of hand. Cut rectangle into ten even sized squares. Place heaping ½ tablespoon of filling into middle of each square. Fold corner of crescent over filling and onto opposite corner. Pinch edges together and lightly flatten center with finger to distribute filling. Place onto baking sheet at least one inch apart. Bake for fifteen minutes at 375 degrees. While turnovers are baking, mix sugar and cinnamon. Remove from oven, allow turnovers to cool for five minutes. Brush each turnover with melted butter and sprinkle with cinnamon sugar. Grab a hot cup of coffee or tea and enjoy! Absolutely Catherine, perfect with tea :) Thanks for stopping by and for hosting Marvelous Monday at Smart Party Planning! I had never heard of Biscoff before so I had to Google it. Yum! This looks simple, and I bet my boys would love it. I'm grateful we were neighbors for Create with Joy today! I used to have a hard time finding Biscoff, but now even our local Wal Mart has it. I hope you can find it close by. You will enjoy these little treats! Thanks so much for stopping by! Wow this recipe looks amazing! And surprisingly not to difficult. I will have to try this one. Pinned for later thanks! Oh me too Diana, far too much as you can tell from above. A jar of Biscoff is not safe around me lol! Mmmm, I love baking anything with apples. This sounds like a recipe I need to try soon. Thanks for sharing it with Hump Day Happenings! Hi Jenna, apples are perfect for baking. Thanks for hosting Hump Day Happening! Hi Jamie! I love baking, not everything turns out the way I want it to on the first try though. I just get back in there and try again :) And oh yes, the apples make it a good for you treat ;) So enjoy! Thanks for pinning. I love apple turnovers and these look tasty and easy! Thanks for sharing with the Thursday Blog hop! Thank you they are easy and oh so addictive, so glad you stopped by! I love apple turnovers and they look so easy. Thanks for sharing on Friday Features this week!! Thank you for hosting Karen! Anything with apples is a winner at my house! Oh, these look good, and you don't have to whip up the dough before hand. Hope you have a great day! Perfect treat when you want something quick and delicious! Thanks for visiting Heidi! Thanks Kimberly, appreciate the party at Lou Lou Girls each Monday! These look so delicious! Thanks so much for sharing it with us at Totally Terrific Tuesday! I hope we see you again this week. Party starts tonight at 10pm! Thank you Christie.. I appreciate the party each week, so much fun! Hi Lorelai, you must try Biscoff. You may get hooked ;) Thanks for the invite. I will be checking it out! Hi Mila, apple desserts are awesome :) I hope you had a great Easter!